Where Shall We Travel for A Taste of Adventure with Anik See? I hope everyone is enjoying a lovely holiday season full of good times with friends and family and festive food and drink, peppered with quieter times for relaxation and reading. If you haven’t found out already, my CTB co-hostess in Athens, Greece welcomed a miniature Food Junkie into the world a few weeks ago. You can find out the details about Johanna’s new baby girl and I know we all wish mother, father and family much happiness with their sweet little one. Our armchair travels with our featured author, Anik See, in her book “A Taste for Adventure” take us to many parts of the globe, and we travel along with her at a leisurely pace by bicycle. This perambulation allows for an immersion in the local environment and interaction with residents that are immediate and intense. I love the chapter on Georgia, where Anik and cycling mate Doug are flagged down by two men who had passed them in their truck earlier in the day and had shot ahead to set up a six hour impromptu feast for their new friends that evening. The next day, this avalanche of hospitality is reproduced at the home of a farmer the two merely hail for information about where to camp overnight and again and again during the “knee-aching climbs” through the Georgian landscape, our traveling pair is loaded with produce, food gifts, overnight stays, impromptu feasts and wine, wine and more wine. Thank you to the Graphics Fairy for this image. I am still savoring this book, wondering which part of the world as described so vividly in See’s book, will inspire my Cook the Books post and yours. Will it be Georgia? Or Malaysia? Patagonia or Armenia? Or Turkey, Iran, Mexico, Canada, Singapore, Indonesia, Argentina or Thailand? Or perhaps I will be inspired to hop on my own bike and navigate the snowy crusts of upstate New York to find an adventure of my own? Our little virtual book club is now over one year old, so I thought I would add a page, “CTB Archives”, at the top of our blog to give everyone an overview of what we’ve read and blogged about. Newcomers to our book club can check out what we thought of the various book titles, who our guest judges were, and who the winning posters were. I’ll try to remember to keep this page updated as we pick new selections and post new roundups. Hope everyone is finding some quiet and restful times to read during this busy holiday season! Hi everyone! I am Rachel, the Crispy Cook, and I am happy to be the current host of Cook the Books, the foodie book club started last year by me and my two blogger friends, Deb of Kahakai Kitchen and Jo of Food Junkie, Not Junk Food. 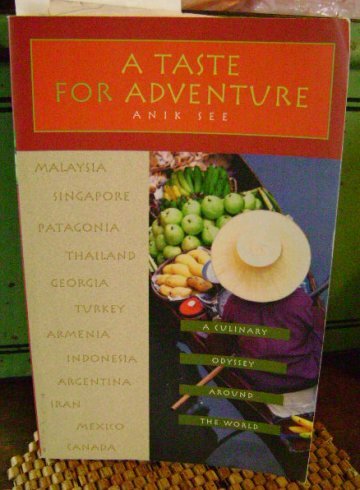 Our current book selection is Anik See’s book “A Taste for Adventure: A Culinary Odyssey Around the World” (NY: Seal Press, 2002). See traveled by bicycle through Malaysia, Singapore, Patagonia, Thailand, Georgia, Turkey, Armenia, Indonesia, Argentina, Iran, Mexico and Canada, and her observations about this intimate tour of these lands and the people she met in transit is absorbing reading. This book was also published in Canada under the title “A Fork in the Road”. I am also delighted to announce that our author, Anik See, has graciously agreed to serve as our guest judge. See previously worked as a researcher for the Canadian television cooking show “The Urban Peasant” and now lives in The Netherlands, where she continues to write, as well designing and repairing books (be still my bibliophilic heart!). You can see examples of her bookbinding and book arts at her website. To join us at Cook the Books, all you have to do is read the book, blog about it and something you cook up that is inspired by your reading. The deadline for doing so is Friday, January 22, 2010. I will post a roundup of blog posts afterward and then our guest judge, Anik See, will read them and pick a winning post. The winner receives a badge for their blog, addition to the Cook the Books blog roll and all the accolades one can put up with. Sound fun? Please do join us, we love reading everyone’s thoughts about our book picks and seeing the creative entries from kitchens around the world.